The rigidity of double-stranded DNA plays a major role in the structuring of the chromosome and thus in the expression of genes, as well as in nanotechnology where DNA is used as a building block. Yet, how is this rigidity influenced by the presence of different types of ions? In this work, teams from the Institut de Pharmacologie et Biologie Structurale and the Laboratoire de Physique Théorique-IRSAMC in Toulouse responded both experimentally and theoretically to this question. Thanks to the massive parallelization of the unique molecule technique of Tethered Particle Motion (TPM), they measured the dependence of persistence length, reflecting the stiffness of the polymer DNA, over a wide range of ions and salt concentrations. 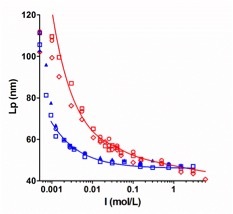 They demonstrated a unique decay for monovalent or divalent metal ions perfectly described by recent theories, which take into account the non-linear electrostatic effects as well as the finite diameter of the DNA. This study will thus make it possible to predict conformational changes of complex structures formed by DNA both in vitro and in vivo. This work was published in Physical Review Letters on January 18th, 2019. Influence of the ionic strength on the persistence length of the double-stranded DNA for monovalent metallic (Li+, Na+, K+, red symbols) and divalent (Mg2+, Ca2+, Pu2+, blue symbols) ions, adjusted by curves from recent theories taking into account non-linear electrostatic effects and the finished diameter of dsDNA.